Facebook updated several of its offerings today, including how it handles trending news and supports fundraising campaigns. Facebook says it has redesigned its trending news function with the goal of surfacing higher-quality content in the news box. Moving forward, clicking on a trending topic opens a new carousel with stories from a variety of publications that users can swipe through. "By making it easier to see what other news outlets are saying about each topic, we hope that people will feel more informed about the news in their region," said Facebook. News articles highlighted in the trending stories section are the most popular on Facebook concerning that specific topic. Popularity is determined by a number of factors. The new trending stories box is available on the web, but Facebook says it is only just beginning to test the new trending stories on Android and iOS mobile devices. Facebook hopes to expand the new trending stories to all mobile users soon. 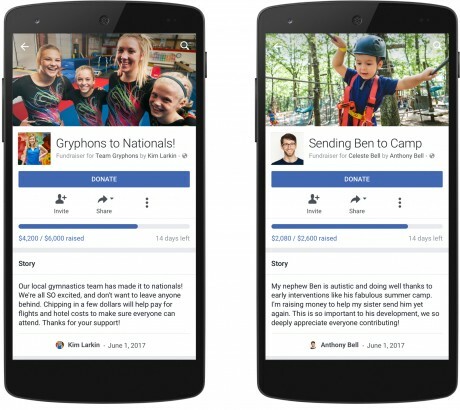 On the fundraising front, Facebook is expanding the ability to raise money to more organizations and groups. For example, personal fundraisers are now available to everyone in the U.S. over the age of 18, and are available in two new categories (community and sports.) Fundraisers are easy to create and share in order to take advantage of the community effect. Facebook says people can raise money for education, medical costs, pet medical costs, crisis relief, personal emergencies, funerals, sports, community, and nonprofits. Facebook says it is able to review all fundraisers and launch them within 24 hours. The platform supports payment processing, vetting, security, and fraud protection for a small fee. Facebook today made it easier for people to raise money to cover a variety of unexpected costs. Facebook is starting with six types of fundraising categories to help cover education expenses, medical costs, pet medical costs, crisis relief from natural disasters, personal emergency relief from house fires or theft, and funeral and loss expenses, such as burials. Facebook has brought the trending news section back to mobile devices, starting with the iPhone. Now, trending stories are visible in the main navigation drawer on mobile devices.